“Thanks for joining us Alex. You’ve been involved in the CrossFit industry for a while now. How did you start and what do you enjoy about it? No worries guys, anytime. I guess when you look at the average time people have been CrossFitting these days I’ve been around for a while but in the scheme of things I’m still very new to the Industry. I actually attended the CrossFit Powerlifting Course last weekend in Sydney. Guys like Rob Forte were there, it was extremely humbling and made me feel like it was my first day of CrossFit. I started CrossFit in 2008 over in W.A. I was friends with a guy called Josh who started training out at CrossFit Perth when Jas Pelham was starting up. I remember my first WOD as clear as day. It was Helen, I didn’t want to tell the guys that I couldn’t do 24kg kb swings, so I did it Rx and was on the couch for 2 days. I guess I got hooked on the mental challenges that CrossFit demands and the fact it pushes you to work on your weaknesses. Wow that’s an introduction and what about Evolutio. Where did that idea come from? I guess I got frustrated that people weren’t getting the right advice. I thought, hang on a sec, if they understood CrossFit they would realise that the person could still squat or run. I originally wanted to provide an online database of health professionals (Physio’s, Osteo’s, Chrio’s ect) that the CrossFit public could utilise by jumping online and finding someone that understood CrossFit. From there the idea changed to The Health Evolution and now Evolutio. Our main aim is to bridge the gap between the everyday CrossFitter and the Health Professional. We want individuals and coaches to understand their body. From our view, people have an increased awareness of what they eat but they’re not learning about their body. This year we’ve designed a Shoulder, Elbow and Wrist workshop for everyday CrossFItters and have been to W.A, N.S.W and VIC. We’ve presented this workshop at 15 CrossFit gyms this year to nearly 400 CrossFitters so they can understand the basic anatomy, physiology, common injuries and how to prevent these over the long term. We also provide business coaching for affiliates to work on their Injury Prevention strategies. Obviously CrossFit has changed a fair bit since 2008. What changes have you seen in terms of people coming in, training, programming ect? There’s no doubt that massive changes have occurred over the past 4 of 5 years. Gone are the days of the ‘do it Rx or don’t bother coming’ mentality. I think when I moved to Melbourne in 2010 there were 5 CrossFit gyms in Melbourne, now there are probably 40 – 50. In terms of people coming in and starting CrossFit, there’s no question that the starting level of overall fitness has dropped. CrossFIt used to be mainly Firefighters, Military and Police of which many had a great level of all round fitness to begin with. These days I’ve had people coming in who can’t run around the block on their warm up without stopping. Do you think that’s good or bad? Well, I don’t know if it’s one or the another, I’m torn. Part of me believes that people shouldn’t start CrossFit until they have a base level of overall fitness. Possibly something like the Police or Army have in terms of a beep test, or time trial run, push up and sit up test aged dependent that people would have to complete prior to starting. Although this is tough on the individual, it would prevent a lot of injuries and issues later on down the track, but If someone really needs CrossFit to improve their health, they need the group atmosphere and they are going to sit at home and be unhealthy unless they are here, what do you do? You can’t deprive someone of that. You touched on Injuries there. As a Physiotherapist what is the most common Injury you would see as a direct result of CrossFit training? I would have one acute and one chronic injury in my list. The most common acute injury would have to be a posterior disc bulge as a result of deadlifts, cleans ect . Most of the time, this happens from repeated flexion or curving through the lower back. In general, about 10 times the force you lift travels through your spine, so Deadlifting 100kg would put about 1000kg of force through the spine. Done repeatedly in slight flexion causes pressure at the front of the intervertebral disc, which pushes rearwards towards the spinal nerves. The most common chronic injury we would see here at the clinic would be Rotator Cuff Tendonitis. Essentially this is caused by wear and tear to the rotator cuff stabilising muscles of the shoulder. Continual use of our biceps and pectoral muscles with CrossFIt, in conjunction with our work lifestyle, tends to round us out through the shoulders. Over time this causes wear and tear of our smaller muscles and tendons that stabilise our humeral head. Imagine a cricket player. For optimal batting he needs to hit the ball out of the middle of his bat. The same thing with your shoulder, the humeral head needs to sit smooth in its socket. If it’s being pulled forward it’s like you’re hitting the ball on the edges every time. Eventually this will cause cracking and wearing of the bat where it’s the weakest. Many injuries I’ve seen at the clinic, are just the final straw. People ask, where did you do it? The individual answers “at CrossFit” and people will say “oh I told you CrossFit was dangerous” the correct answer should be “at work, because I was too busy to sit well, or take breaks”. It’s like doing a CrossFit workout and saying, “Oh I didn’t watch my form because I had so many different exercises to do and I was being rushed” So it’s important to realise that CrossFit, especially when taught well shouldn’t be the causing factor of many of our Injuries. We need to have a look at how long we’re sitting, standing or repeatedly lifting as well. What can people do to avoid these Injuries? Is it more of a Programming issue or an Individuals training methodology? I thought this question would be next! This is a massive area. Essentially a majority of the responsibility has to be placed on the individual. I think they need to start CrossFit with a base level of fitness and strength to put themselves in the best place to achieve long term outcomes with CrossFit. They also need to listen to their body and scale appropriately, especially early on. The amount of times I’ve seen people come in, get their war face on and tear away at that bar like they’re hyenas at a zebra are countless. People need to understand what level they’re at. Progressing for instance on pullups from banded to kipping could take years. People these days expect it will happen in weeks. It’s not going to happen, and if it does, you’ll break down because your body isn’t ready to handle it. I always say in our workshops that people are so carried away with the kip in pullups. Why? There’s no point getting up there if you can’t control yourself on the way back down. The loading phase as they come down is massive on the shoulders, and someone that isn’t controlling that will cause huge shoulder problems overtime. Imagine if I got a big guy to come and yank your shoulder as hard as he could for 5, 10 or 15 minutes once or twice a week. You wouldn’t like it, but that’s what people are essentially doing. I think programming has changed, most boxes offer on Ramps to start people into CrossFit which is a great idea. People need to learn all the core movements, do them safely and they can then integrate into the classes in time. Thanks Alex, you have some big plans with CrossFit and Evolutio. What’s planned for 2014? Thanks guys, we have some massive plans. We’re running a nationwide fundraiser on the 26th October 2013, aiming to have 150 affiliates and 3000 CrossFitters sign up to register, take part and raise over $50,000 for Soldier On (supporting the Psychologically and Physically wounded Australian Solders) and Brant Garvey our Sponsored Athlete who is a congenital above knee amputee from birth aiming to reach the 2016 Paralympics in Rio. Affiliates and Individuals can jump to our website at to find out more. 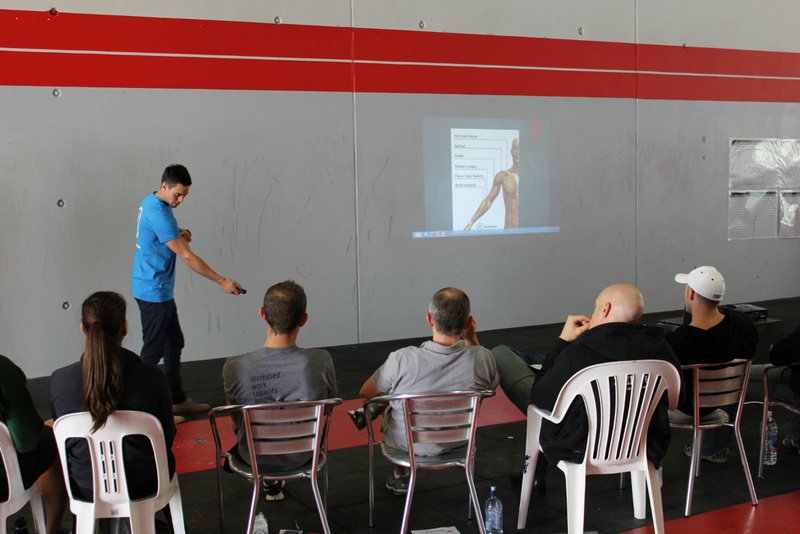 We are currently putting together the final touches to our CrossFit Coaches Course, which will be a full day course to better prepare CrossFit coaches In terms of Anatomy, Physiology, Common Injuries, Prevention, When to refer on and Programming. As well as our Everyday Hip and Spine workshop. We’re aiming to run 80 workshops and 10 Coaches Courses next year. To better educate 1500 CrossFitters in Australia. Alex is the Director of Evolutio, he is a Physiotherapist and CrossFit Coach. Evolutio has a Sports Injury Clinic in Richmond, Melbourne. Alex and the Instructor team at Evolutio are currently putting together their workshop and course schedule for 2014. Affiliates throughout Australia can register their interest via emailing info@evolutio.com.au if they would like the Evolutio team to conduct a workshop at their gym for their members.